On April 27, I asked Steven Miller, co-author of the MSU report, why they had not included the costs of the program in the work. He quickly responded that the costs were left out because he and his co-author were measuring the "economic impact of the film industry expenditures, not necessarily the incentive program." However, the title of his study belies this assertion: "The Economic Impact of Michigan's Motion Picture Production Industry and the Michigan Motion Picture Production Credit" (emphasis added). It is hard to imagine from the title alone why the paper would not examine the net impact of the incentive program - that is, why it would not include the costs, too. 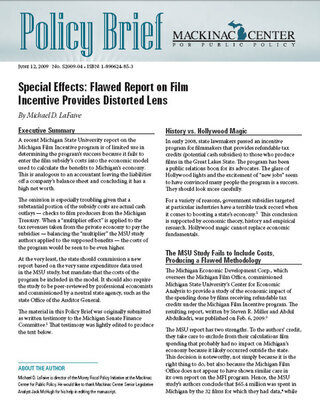 And consider the opening paragraph of the press release that accompanied the report: "A Michigan State University study has found that the state of Michigan's law providing tax credits for film production companies that shoot their movies in Michigan is a big time hit." At a minimum, the MSU report and press release should have included a disclaimer that the costs of the program were not included, so that news agencies and others would have a better perspective on the report's conclusions. Ironically, on Page 4 of the study, the authors write, "Deriving meaningful estimates of the economic impact of film production expenditures requires careful consideration of what makes up the direct expenditures and proper assignment of these direct expenditures to various industries." In fact, meaningful estimates of any government program's efficacy require careful consideration of all its aspects — including its costs. Without a massive and costly state subsidy, the authors would have had little filmmaker activity on which to report. How could MSU publish a study with such a fundamental flaw? Simply put, the REMI economic model does not force its users to input a budget constraint. The model treated all of the expenditure data the MSU authors entered as the equivalent of manna from heaven. It is not. In order to enrich filmmakers through taxpayer subsidies, the state must necessarily diminish the wealth of others. Assume for a moment that the program really did create 1,102 jobs in 2008. At a cost of $48 million, this figure works out to a state subsidy of $43,557 per job: a staggering sum in light of Michigan's fiscal problems. More troubling yet is that this program was born on the heels of 2007's $600 million Michigan business tax surcharge, up to one-third of which may one day be eaten up each year by checks written to filmmakers. Lawmakers should realize that Michigan businesses might easily have created a mere 1,100 additional jobs in 2008 if the Legislature had simply not raised their taxes.